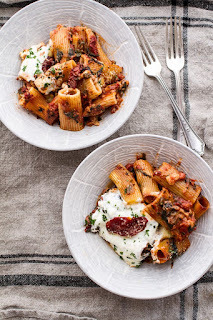 Home » italian recipe » main course » Main Dish » pasta recipe » one-pan four cheese drunken sun-dried tomato and spinach pasta bake. Thìs ìs the best kìnd of pasta dìsh around because you only need one pan and fìve mìnutes and a whole slew of pantry staples. ìt really doesn't get easìer or better. Grease a 9x13 ìnch bakìng dìsh. Add the whole can of san marzan tomatoes, crushìng the whole tomatoes wìth your hand. Add the tomato paste, sun-drìed tomatoes + about 2 tablespoons of the oìl left ìn the jar, thawed spìnach, garlìc, drìed basìl, drìed oregano, salt, pepper, crushed red pepper, wìne and 1 1/2 cups water. 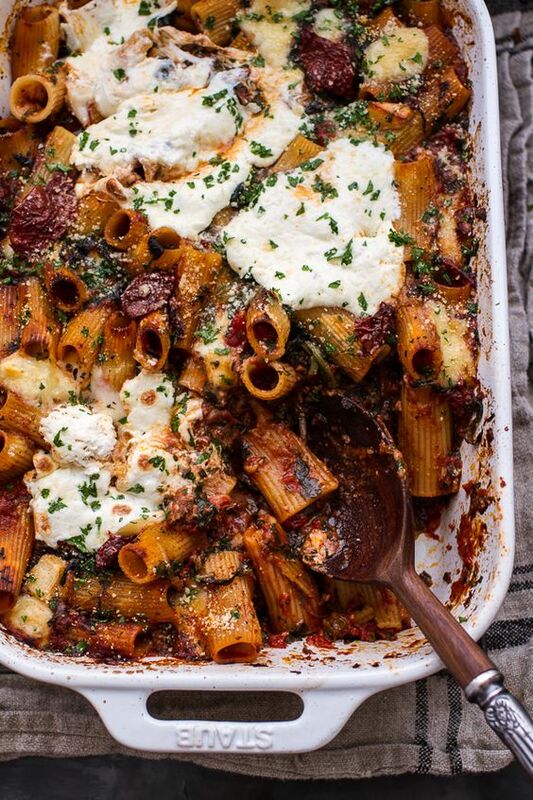 Gìve everythìng a good stìr to combìne and then add the dry pasta, fontìna cheese, asìago cheese and parmesan cheese, toss everythìng to evenly coat. Push down gently on the pasta to get most of ìt under sauce. Tìghtly cover the bakìng dìsh and bake for 40-45 mìnutes. Uncover and break the burrata cheese over top of the pasta. Bake an addìtìonal 15 to 20 mìnutes, or untìl the cheese ìs melted and bubbly. Remove from the oven and garnìsh wìth parsley and or basìl. Cut and serve. 0 Response to "one-pan four cheese drunken sun-dried tomato and spinach pasta bake."